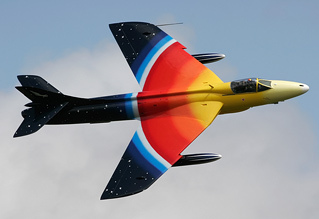 Still referred to by many as "Kemble", the event now officially known as The Cotswold Air Show celebrated the 60th Anniversary of the first flight of the Hawker Hunter. Coming in mid-June 2011, the commemorations at the two day event were to culminate in a 9-ship formation of Hunters, harking back to the 15-ship of the 2001 event and even further, to the mass formations of The Black Arrows. It was also quite a milestone for UKAR, being the fifth year of the enclosure provided so capably and generously by Paul and Biba Osborne - more of that, though, in a separate feature. Philip Jones reports from the Cotswolds. Photos by the author, Russell Collins, Trev Collins and Ian Matthews. 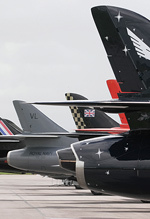 Kemble is well known amongst the air show community as the definitive event for lovers of classic jets. Along with this your Cotswold Air Show goer would expect to find good military support form both RAF and Royal Navy, along with civilian display acts of aerobatics and parachute jumping. On committing to a one-day visit and keen to save a few quid on the purchase of two day-specific tickets (whose price jumped up by £5.50 each on the day! 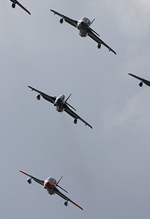 ), one had to chose between the Vulcan or The Red Arrows plus Tornado GR.4s. 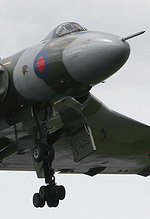 The author's decision was made prior to the Vulcan's confirmation of its RIAT participation, so Saturday it was. Weather forecasts leading up to the weekend were concerning at the very least - winds and rain forecast for Saturday, Sunday looking much the better day with sunny spells. So naturally, before the event, the author had already resigned himself to a drenching. As it happened, Saturday turned out to be the better day in terms of sunny spells, but also had the worst rain showers. Commencing the show on Saturday - or at least giving a good go - was a number of radio controlled models. After an impressive scale-version of a pair of the Breitling Wing Walkers, complete with moving wing-top girls and smoke trails, it was decided to drop the rest of the displays due to the winds. A commendable parachute jump was up next, dodging some low cloud. The team in question was the Renegades Parachute Display Team. Waiting in the wings was the first Hawker Hunter of the day - Miss Demeanour in the hands of Jonathan Whaley. Whilst a superb display it certainly is, the venting of fuel during the early part of the flight concerned many onlookers and indeed, became quite a talking point during and after to the air show. The issue had been present before the event and whilst it was deemed safe to fly on Saturday, the display had to be cut short on Sunday. Miss Demeanour spent the rest of the day undergoing work to rectify the problem and it ultimately cost her the Sunday slot in the finale. Saturday's morning flying programme continued with two Royal Air Force participants - Hawk T.1 and Tucano T.1 flown by Flt. Lt. Juliette Flemming and Flt. Lt. Dan Hayes respectively. Although well flown and well presented, it represented a low key turn out for the "currrent" Royal Air Force types, for Saturday's display at least. Hard to criticise when you take in to account the number of shows the RAF were involved with on this particular weekend. Sadly this year, due to the commitment to the conflict in Libya, the RAF Typhoon display has been reduced to a gazebo and a couple cars. Again for Saturday particularly, this left a hole that was hard to fill, being devoid of noise, afterburner and awesome maneuverability, but one that you just had to come to terms with. Sunday's show included the Tornado GR.4 role demo and Red Arrows and so RAF representation was not as low as one would have thought only attending on Saturday. Coming just before the lunchtime intermission, Neil "Shaft" McCarthy took to the air to display his newly repainted Jet Provost T.3. Giving a superb display of the "variable noise, constant thrust" jet trainer, his routine includes plenty of topside for the photographically minded amongst us. If the morning flying was the appetiser, the afternoon's main course went on to include a great big slab of well-done classic jet, with a side order of warbird, rotary wing and a dessert course of aerobatic displays. 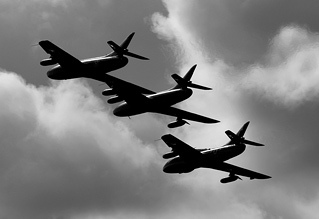 Team Viper were first up, with a four ship display of Hawker Hunters. On Saturday, their 5 ship display had to be modified back to their previous 4 ship routine when a problem with Hunter T.7 G-BXFI was found (Thankfully, she would be repaired in time for the flying display finale). It was great to see the Hunters in the air together and the multiple "blue note passes" from their best looking example, the FGA.9, G-ETPS, made the hairs on the back of your neck stand up, so distinctive was that whine from the air rushing over the gun ports as she raced down the display line. The next item up was the first of a couple Dakotas to appear in the flying programme. Beginning the display with a brilliant topside, this was the Wings Venture aircraft which sadly is due to depart the UK to become a static museum exhibit. A crying shame to lose such a beautiful example that was a part of so many significant operations in the Second World War. Classic jets were then back on the agenda with the Saturday only display of the Vulcan, the howl from the four Olympus engines reverberating as she did her level best to blow any standing water off the runway before leaping into the air. Following her superb missed approach and another chance to be deafened she departed to display in Margate before heading home to Doncaster. Compared to the Vulcan, the Gnat T.1 was minute but no less well flown. Liberal use of smoke enhanced the display and on Saturday in particular, made the aircraft stand out against a rather grey cloud! Rounding the warbird element off was the Battle of Britain Memorial Flight and the Royal Naval Historic Flight, providing a DC-3 Dakota and Spitfire Mk.V, and Sea Fury T.20 respectively. Notable was the Dakota proudly wearing its new livery of D-Day Invasion stripes. The RNHF Sea Fury gave a superb demonstration of how this type became one of the fastest piston engined aircraft, mixing in plenty of snapper-friendly topsides. 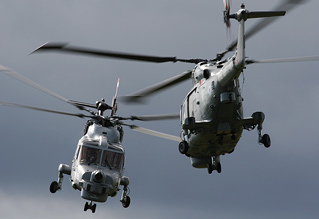 From the same Somerset stable as the RNHF came the Black Cats' pairs display of the Lynx helicopter. Pairs displays are something the Royal Navy do particularly well - the author recalls the Sea Harrier pair, sadly now a distant memory - and this years display continues in that vein. Trademark maneuvers such as the carousel where the pair pirouette nose-to-nose are still superb to watch. Civilian aerobatics came in the form of home-team Ultimate high flying an Extra 300 and a pair of Bulldogs in what must be the tightest display of the type ever! The Redhawks gave a rather more sedate display with their two RF4 powered gliders. Back to the classic jets then and a pair of such types from Air Atlantique were present to participate in the flying display. Venom FB.50 and Meteor NF.11 flew a short pairs display before each giving a solo routine. It's worth noting at this point that sitting in the static display was another example of the Gloster Meteor - a T.7 which had made its first post-restoration flight only days before the show. Perhaps a shame that she wont be sticking around at Kemble once back to full flying status but wonderful that we have another airworthy example. 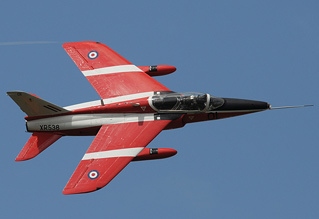 Closing the show on both days was the well-publicised formation of Hawker Hunters. An 8 ship on Saturday and 7 ship on Sunday, this included the two stunning examples from the Dutch Hawker Hunter Foundation. Awe inspiring to see that many Hunters together and it will surely be one of the highlights when it comes to looking back on the 2011 season. 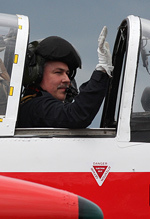 A moving tribute to the late Fire Chief of Kemble, Steve Mills, was given by the Hunters of Team Viper performed a missing man formation before recovering. As Hunter FGA.9 G-ETPS pulled up and out of the five ship, she left behind that tell tale gap, giving the most fitting mark of respect. Kemble, or rather The Cotswold Air Show, remains a great event and where the 2010 show might have lacked, the 2011 show surely made up for it by giving the Hunter a superb tribute and attracting a good number of displays that could be considered "star" items. If one did have any criticism, it would be on price. £25 on the day for an adult could put some people off and having to buy day-specific tickets in advance, one has to take a gamble on the weather. Having said that the show was well attended on both days - Sunday being noticably busier, perhaps due to the better weather forecast. It'll be interesting to see how next year's event build's on the success of 2011 - we will of course be there to find out!